10 o’clock on Saturday morning to 5 o’clock, 9.30 on Sunday to 4.30. We will take Still life as our theme, in order to study line, form and volume from still-life set ups in the studio. I will give demonstrations and individual attention to students. The price is 150 € lunch is included in the price of the course. A deposit of 50€ is demanded to complete your inscription. 8 students maximum are accepted, so please book early. This will be the 10th year that we have run courses from our studio and home in the South West of France; Catus 46. I am a practising artist, specialising in pastel, with 20 years of teaching experience. Each summer my husband and I look forward to welcoming a group of new and returning artists to Catus. All levels are welcome, commitment and enthusiasm are the only credentials. During the five days, we will explore various themes, landscape, still life, and figure, with a model available. 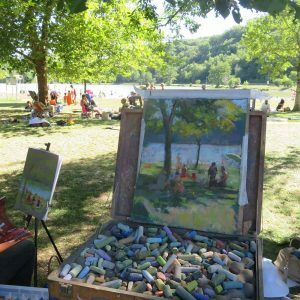 I will teach pastel technique, drawing and colour mixing. The summer light is particularly beautiful in the early morning and late afternoon, so depending on the weather, it’s preferable to stay flexible for our working hours. The studio is always available for indoor work. 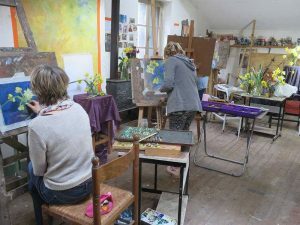 Three hours of pastel painting in the morning will be followed by a meal at midday. This is your time to relax and discuss with like-minded people. A break after lunch allows for a swim, a siesta, a drawing, or look at some of the many art books. 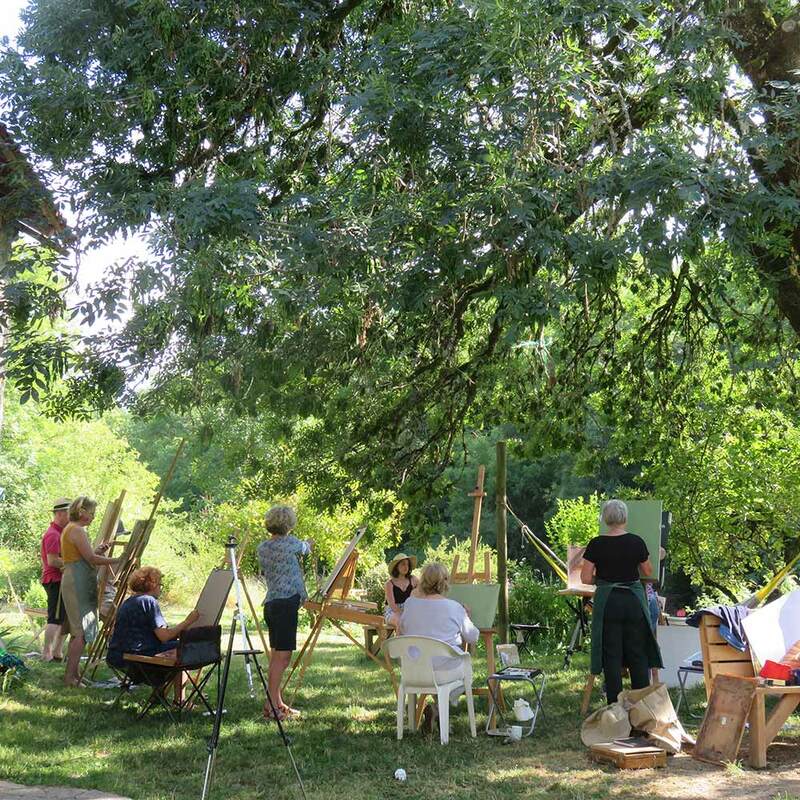 In the afternoon, we may head out to work en plein air in the local landscape, or perhaps draw from the model in the garden. The Price of the five day course is 400€. This does not include accommodation, or materials. A materials list is available on request. “Pénélope est généreuse d’elle-même, s’adapte à chaque stagiaire, il y a un savant dosage de démonstration, de partage de savoir-faire, une bonne communication de sa passion. 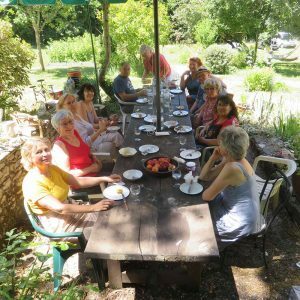 .Je tiens également à remercier le cuisiner François pour son savoir faire qui nous a permis de partager tous ensemble de bons moments à table. The 10th and 11th of July 2017. 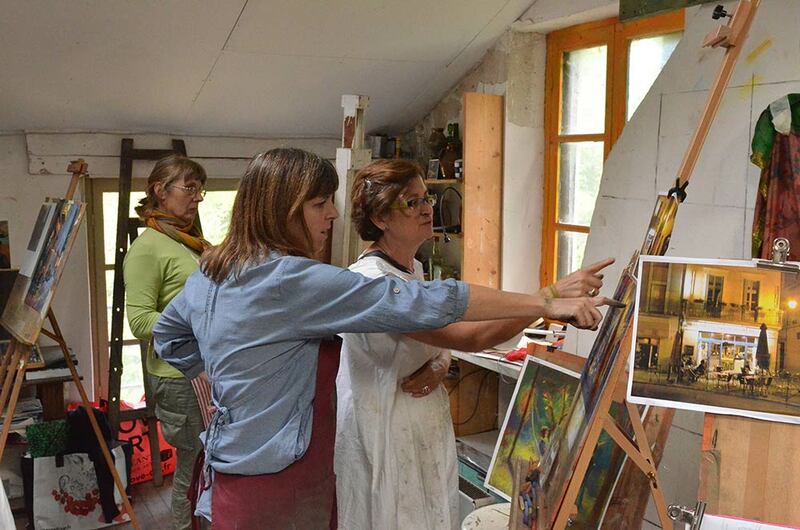 Pastel course with model, based in the studio or posing in the landscape. Finding individuality in your pastel paintings. We will have a model available for at least one full day. possibly scenes around a farm. 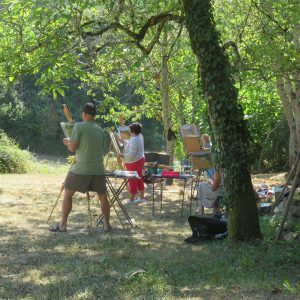 A part of the course will involve going out and gathering material for our paintings, sketching outside with pencil or charcoal but also small pastels done from life with limited colour. Some of these ideas can then be worked up in the studio, with the help of photographs, into larger pictures. A camera will be essential. A box which can contain around 60:80 pastels in order to simplify working outside. A portable seat and easel. My Courses this summer 2016. 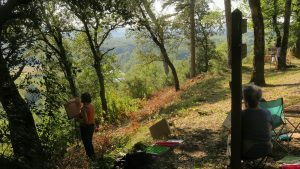 Landscape course, the 11th and 12th of July 2016. We will begin at 9.30 in the morning and finish at 12.30. Lunch break lasts until 2.30 when we start our afternoon session continuing until 5.30pm. Price: 110€ with picnic lunch included. We will look at techniques for representing foliage and for portraying a sense of distance in our landscape work. Assuming that the weather is fine we will be outside in situations as comfortable as possible/ quiet and shady! But if we are unlucky and rain is forecast the studio is always available. I recommend that each student brings a minimum of 4 sheets of good quality pastel paper; ie pastelmatt or pastel card 23x30cm or 30x40cm and reasonable selection of landscape based colours. A minimum of 60 is a good estimate. Stage Portrait. Deux jours à Catus le 14 et 15 juillet 2016. Prix du stage : 125€, ( repas et modèle compris ). Nous travaillerons dans mon atelier de Catus et nous aurons, une partie du temps un modèle ‘ Anna) qui nous permettra d’étudier les proportions, les volumes et les couleurs. Nous pourrons faire des croquis rapides mais aussi travailler sur un tableau plus conséquent. Les horaires sont: 9h30 à 13h, pose repas puis reprise à 14h30 jusqu’à 17h30. Pour réserver se rendre sur la page de réservation de stages : un chèque d’arrhes non remboursable ( sauf impossibilité de ma part) vous sera demandé. Apportez deux feuilles de papier pour pastel ( pastelmatt ou pastelcard , prenez aussi du papier pour les croquis. Stages limités à 8 élèves.